American Apparel in Neon Red is one of the most intense nail polish shades I own. It's a neon popsicle red/coral. My mom wore it first a few weeks ago and I had no idea it was that bright. She received a lot of comments about it! These photos don't even show the true amount of intensity, like it burns my eyes to look at it and it can probably be seen from a mile away. I discovered a few days in of wearing it that it looks incredible under black light as well. The formula is somewhat different than the usual one from American Apparel as it requires more coats (I used three) and has a semi-matte finish (I used a top coat.) It's still an amazing formula and I took these photos after about a week of wear. It looks so cool under backlight! 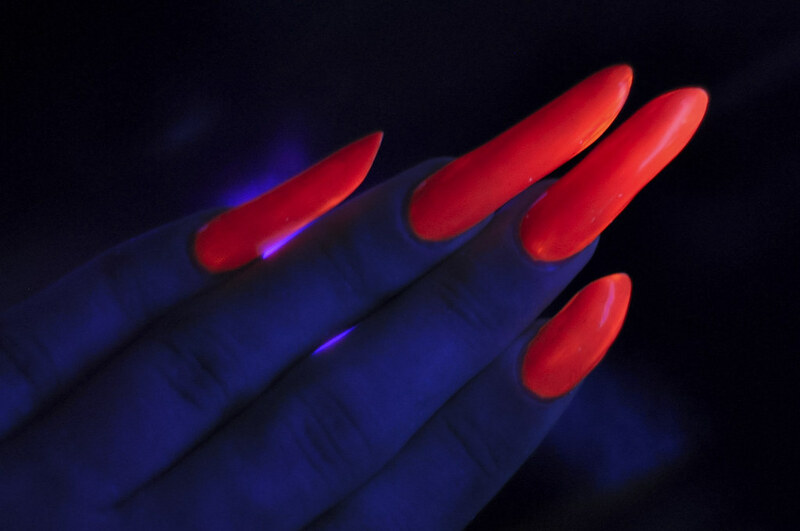 I'm always so fascinated by neon or glow in the dark polishes. Very nice! Thanks. Me too, I really want to use more now!